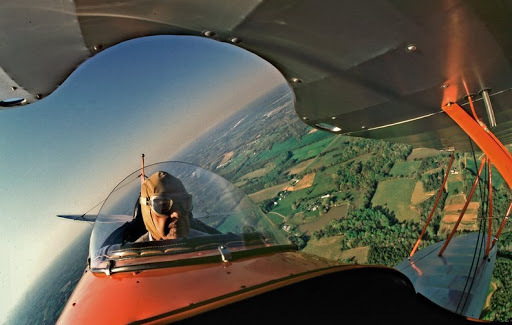 This image was shot from the front seat of a Waco RNF biplane built in the early 1930’s. The pilot, Ken Brugh, was in his mid-80’s at the time. Something pretty cool about cruising along at about seventy with the wind blowing through your hair. I shot this several years ago for a “day in the life” book on North Carolina. Ken was an interesting man with a world of aviation experience. He grew up barnstorming in the 20’s and 30’s. During World War II he ran a flight school for the Army and ran the fixed base operation Air Services in Greensboro after the war until he retired. He owned and flew this airplane as well as a Waco cabin biplane and an Aeronica.